The last day of January has been the busiest day of the year for me! You’re probably saying to yourself, “Monday? A busy day? It’s only the start of the week…? And Beleen is freaking out over what exactly?” Are ya thinkin’ something like that? Am I close? 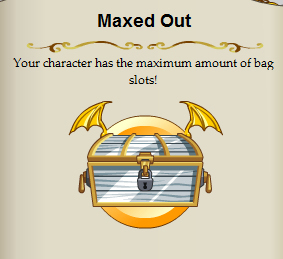 On Friday, the MAX number of obtainable Inventory Slots in your Backpack went to 100, and MAX Bank Slots went all the way up to 250 (and you can still store an unlimited amount of AC items in your bank)! Two new achievements were *supposed* to be added to the Book of Lore on Friday... but something went horribly wrong and the ‘Spaced Out,’ ‘Maxed Out,’ and ‘Superhuman Vault’ badges weren’t working properly. BUT NOW THEY WORK! Yay! Thanks to the hard work from Yorumi, Llussion, and Minimal, and the tears from yours truly, these achievements now work and show up in your Book of Lore. The Spaced Out badge appears when you have 75 slots in your Inventory, Maxed Out is awarded for getting all 100 Inventory Spaces, and Superhuman Vault appears when getting all 250 bank slots. Have you played through the entire CAD Event? Helped Ethan retrieve his Winter-een-mas Crown? And now you wanna farm Battle Zeke buuuut that Cutscene keeps playing and kicks you back to GameHaven? Well that’s been fixed, too! After you defeat Battle Zeke and complete all the quests in GameHaven, the Warehouse, and Arcadion, you will never have to watch that Cutscene ever again after you pwn Battle Zeke. So happy farming—he has 6 wicked drops if you’re lucky enough! Also, the Character Page Achievement for the Ctrl+Alt+Del event is still not working. But fear not! Zhoom the fancy-pants programmer says that these achievements *should* show up sometime tomorrow. Once they are up and working properly, we will announce it on the Homepage, on these Design Notes, and on our Twitters =D! Holy groundhogs! It’s ALMOST February 2nd! Do you know what that means? …uh yeah, I guess my little subtitle thing up there gave it away. It’s Groundhog’s Day! On this day every year, Philip the weather predicting groundhog pops his head out of his hole and peers around. If he comes out to play, then spring is here! If he sees his shadow and vanishes back into his warm, cozy burrow, then we know that we are in for SIX MORE WEEKS of winter! What will Philip predict this year? 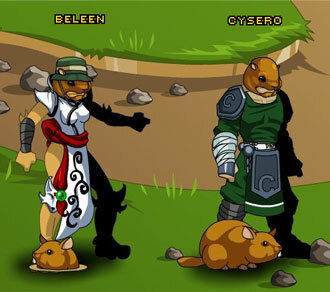 Log in this Wednesday for a mid-week Groundhogs’ Day release! February 3rd marks the Chinese New Year—the Year of the Rabbit! So to celebrate this 15-day long festival, Akiba on Yokai Island is currently being decorated with lights, lanterns, and fireworks, and will be fully ready by Friday night's release! There will be bunches of new quests and even more new items to choose from to get you in the spirit of things! Princess Miko is EVEN getting a makeover for this special occasion. She’s ganna look sooooooo pretty! Hehehhe! 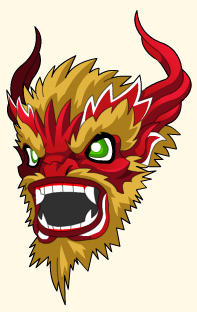 Last year for Chinese New Year, we offered a very special non-member pet for AdventureCoins. And this year… we’re doing the same thing! Can you guess what it’ll be? ARE YOU SERIOUS?! Three events in one week? This is MADNESS! No actually… this is AQWorlds. And we do these kind of things all the time! And this Sunday is Super Bowl XLV! So, naturally, Battleon is celebrating this too in the only way we know how—with pigskin weapons, deadly pom-pom chakras, giant foam fingers, moglin referees, protective headgear, football armors, and cheerleader costumes. /Cheer your favorite team to victory while showing your Super Bowl spirit! They don’t call Dage “the Evil” for nothing! Awhile ago, in the Black Market Shop (which has currently vanished… and no one knows if the Vendor will come back or not…) had a pair of totally awesome weapons called the Reavers of Amenti. 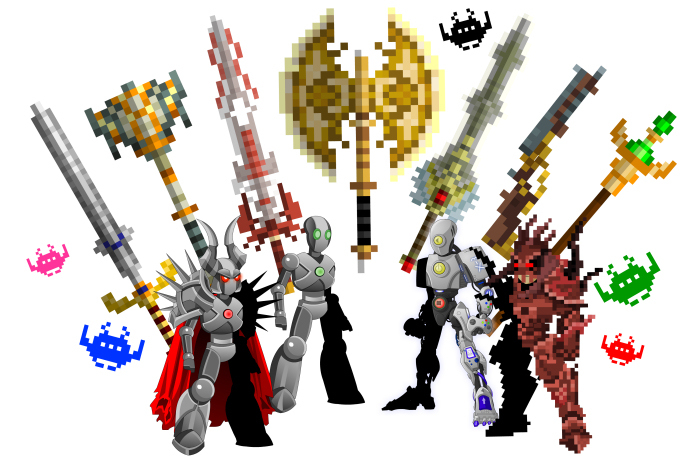 Dage the Evil mistakenly said on his Twitter that the Reavers of Amenti would be a requirement for a future item in his Merge Shop. BAD DAGE, BAD! No one can make such promises, and last week when his “Zealith Reavers” were added to his secret shop secretly hidden in a secret place somewhere in Lore, the Zealith Reavers DID NOT require the Reavers of Amenti as a turn-in. But wait, there’s more! 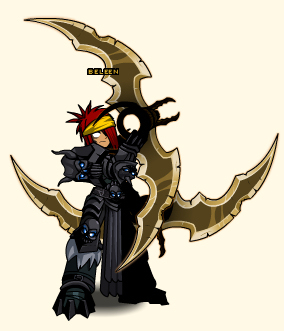 If you don’t like the Reavers of Amenti because you wanted Dage’s Zealith Reavers instead, feel free to sell 'em! The Zealith Reavers are still in Dage’s secret Merge Shop and can be obtained only by completing his ridiculous quests and having some serious luck to get the necessary item turn-ins. You guys have been great! And you have survived yet another one of my ramblings. Hehehhee! It’s only Monday, and it’s been the craziest Monday yet, but this hectic day promises a glorious week ahead! Hey…hey… look what I have for you! *shhhhhhhhhhhhhhhh* No one knows this yet… but I snagged a spoiler screenie of a few of the items from the Ctrl+Alt+Del Event tomorrow! Ready for your daily dose of awesomsauce? Hi everyone! It’s only Tuesday and already soooo much is going on that I just HAD to share with someone. And that someone is you! TWO Birthday’s Today? Two Captains, too?! Ding! Stratos of the Skyguard and Captain Rhubarb have both leveled up today! Gratz, guys! Stratos landed his airship in Battleon for his special day. Talk to the captain to get your hands on some super awesome Stratos-approved goggles and TWO of his own custom swords! I’m not sure how long Stratos will be in town… so make sure you wish him a Happy Birthday before he takes flight! Wanna score some epic threads in real life? 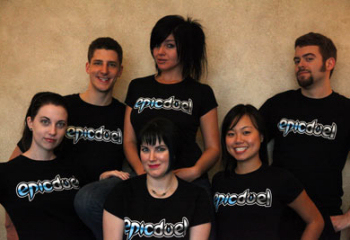 Head to HeroMart now and be the first to equip the super epic EpicDuel T-Shirt! A +10 Defense buff comes standard when putting on this shirt. 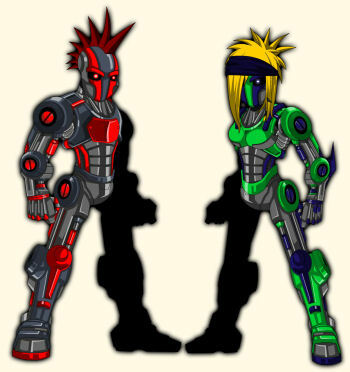 But as an added bonus, the Color Custom Cyber Hunter Armor in AQWorlds is yours when you enter the special code that comes with the shirt! It’s the moment we have all been waiting for…for the past week and a half. Cysero worked his magic with the creator of the webcomic Ctrl + Alt + Del and we will be hosting the in-game event this Friday! 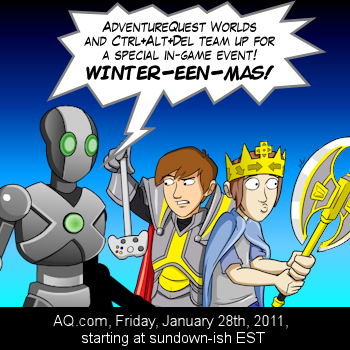 The last week of January is a very special time of year for CAD fans... it's Winter-een-mas, a holiday just for gamers! But this Winter-een-mas… something is not quite right (other than the whole holiday not bring quite right). The Winter-een-mas Crown has been stolen and Ethan, Lucas, Lilah, and Zeke need your help getting it back! There will be Winter-een-mas rare items pulled directly from the pages (web pages) of Ctrl + Alt + Del plus some stuff you've never seen before… like the 16-bit Item Sets in the AC Event Rare Shop! 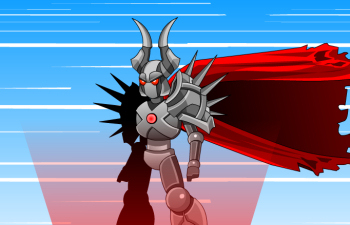 Digital DOOMknight Armor and Helm, Blade of 16-Bit Awe, and the Light of Digital Destiny! Completely Color Customizable CardCaster Class?! 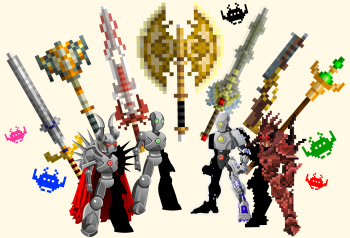 If you happen to follow me, Dage the Evil, or Cysero on Twitter, then you probably caught a sneak-peek at the newest Class making its way to our Inventory Bags. This completely color custom Class—based off Base, Accessory, Trim, and Eye Color—is still in the making and has no scheduled release date yet. But this Class is special. Very special. 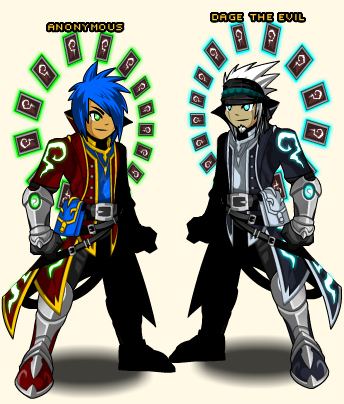 The only way to get this Class is by getting your hands on the not-yet-released BattleOn Game Cards set! Artix, Mido, Cy, Dumoose, and the entire Team have been hard at work on a physical card game that will hit store shelves in the next few months (if everything works out like we hope it will).The card game is SUPER INCREDIBLY fun and I cannot wait until it is actually finished! I’m sure Artix will give you some more spoilers as the card game nears its final stage. But for now… that’s all I can say. If I haven’t already said too much. Yipes! And, um, as for the Inventory/Bank Space improvements…. Zhoom? …Minimal? Where are you guys?! Alright! Time for me to get back to working on the Ctrl + Alt + Del event. As our first HUGE event of the new year… we gatta make sure it’s as epic as it can be!